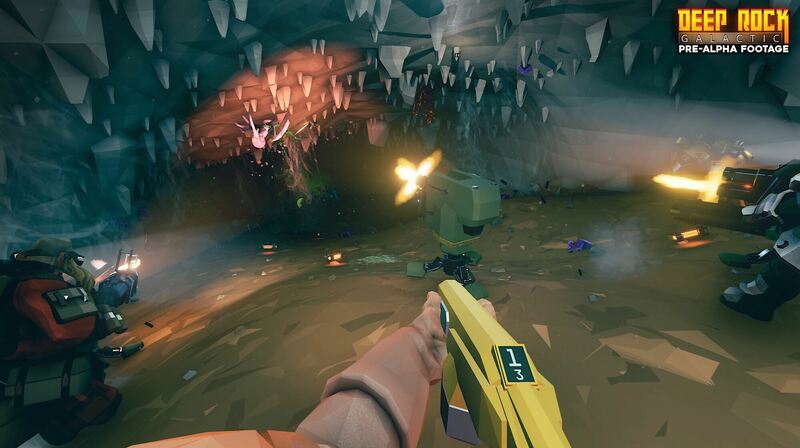 It's as if Minecraft and both Astroneer and Left 4 Dead had a baby! It's not very often I get the chance to write a preview about a not fully released game yet. This is one of those times. Having been launched on the Xbox Game Preview program on the 28th of February I was gracefully given the opportunity to try out the game on its launching state. A month and a few days later here I am to talk about it - after a few improving updates also. I chose to give it some time mainly because of that: to test the initial state of the game and to observe the evolution of things the devs are bringing onto the game. So, what's the game all about? 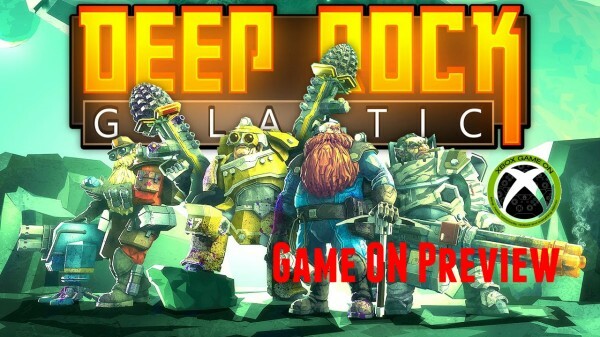 Well, Deep Rock Galactic is all about badass dwarves that undertake jobs in mining the deeps of the planet Hoxxes IV where it is full of monsters and dangers. So who better than a bunch of dwarves to complete the job of extracting the riches from the deep? The game is played via a first person perspective with up to 3 more people in cooperative mode. Or simply by yourself. There are four classes to choose from: Engineer, Scout, Driller and Gunner. Each has their own particular sets of skills and equipment, obviously. The Engineer differs mainly because he uses turrets to aid himself and others, the Scout usually is the one that moves ahead of his brothers lighting up the caves, the Driller, well, drills better than the others and the Gunner is there mainly to help out in cleaning the place and keeping other dwarves from monsters' harm. Of course, they also have other gadgets as well to help out on their job. The cave systems presented to us are nicely procedurally generated, so this means we might never play the same cave ever again. Oh, and a nice add-on is that they are fully destructible so you can just start drilling away in any direction as you please. So a game starts always after you've exit the drop pod deep beneath the planet's surface and you have to use any means to gather riches and other things in order to fulfil the company's specific requests. You might get lucky and strike a cave system that is full of the stuff you need to collect right away, but usually you have to go deeper into darkness. From time to time you encounter monsters and other times suddenly a swarm tries to overcome you - you get a warning before that happens. Needless to say, teamwork is very important, especially when playing with 3 other people. Monsters also come in various shapes and sizes, from the little annoying creatures nibbling at your toes to the flying or wall crawling ones, to the big baddies that take more than a few hits to kill. After reaching the mining goal you can call for an escape pod and things get pretty hectic from there because not only usually it lands kind of far away from your position, you will also will have to fight through a sort of "last wave" of enemies. Oh, and you also have to get back to said escape pod in time, or else it will leave with the minerals collected but without you! Talk about expendable eh? After each mission, players get experience points to level up. You can use these to improve your skills and buy new upgrades as well. You can also buy cosmetic items to change your dwarf's look as you please. The game currently features 4K resolution, 60 fps and HDR mode. A few upgrades have since launch been implemented like new conten in caves, possibility to view where other players are when you die, new animations in weapon handling and improvement and other smaller additions. The game is coming along nicely and, as always in games of this nature, it is much better played with friends or at least with other people cooperatively, than alone. There is a bit of lack of content in terms of maybe new classes and gadgets and such, although I am sure the devs are adding much more in the near future.